1. Put the chicken in a pan with the ginger, salad onions and 1 tsp peppercorns. Cover with cold water, season with salt and bring to the boil. Reduce the heat and simmer for 20 minutes. Transfer the chicken to a bowl of iced water (reserve the stock). Cool for about 10 minutes, then drain. Discard the skin and bones. Pat the meat dry, brush with sesame oil, slice and chill. 2. Heat the vegetable oil in a pan with the star anise and remaining 1⁄2 tsp peppercorns for 3-5 minutes, until dark brown but not burnt. Put the chilli flakes in a large bowl, strain over the hot oil and leave to cool. Bash the cucumbers with a rolling pin until they split and crack, quarter lengthways and roughly chop. Toss in a colander with a large pinch of salt and leave to drain for 20 minutes. Squeeze to remove any excess water, then mix with the chilli oil, rice vinegar, soy and garlic. 3. For the relish, heat the oil in a frying pan. Add the chopped salad onions and ginger; fry over a medium heat for 3-5 minutes, until soft. Add 5 tbsp stock and cook for 3-4 minutes, until thickened yet spoonable. 4. 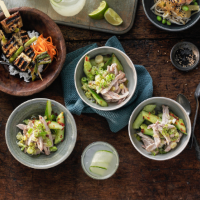 Serve the sliced chicken in bowls with the cucumber salad and ginger relish and top with the thinly sliced salad onions.